Paper Spotlight: "Extinction Maps and Dust-to-Gas Ratios in Nearby Galaxies"
Dust is a major component of the interstellar medium in galaxies. It plays a major role in star formation, serving as both a means of radiative feedback and an important catalyst for the formation of molecular hydrogen. It also serves as an important reservoir of metals within a galaxy, which can impact chemical evolution models. Last, but most certainly not least, it scatters and absorbs optical and ultraviolet light. While this makes for beautiful pictures of galaxies, it heavily impacts studies of star formation, stellar populations, and star formation histories. Understanding dust and its interactions with stars and the rest of the interstellar medium is therefore key to understanding galaxies as a whole. Lauren Kahre, a 5th year graduate student, has recently published a paper about mapping the dust in nearby galaxies in order to better understand the stellar populations that lie underneath dust clouds. 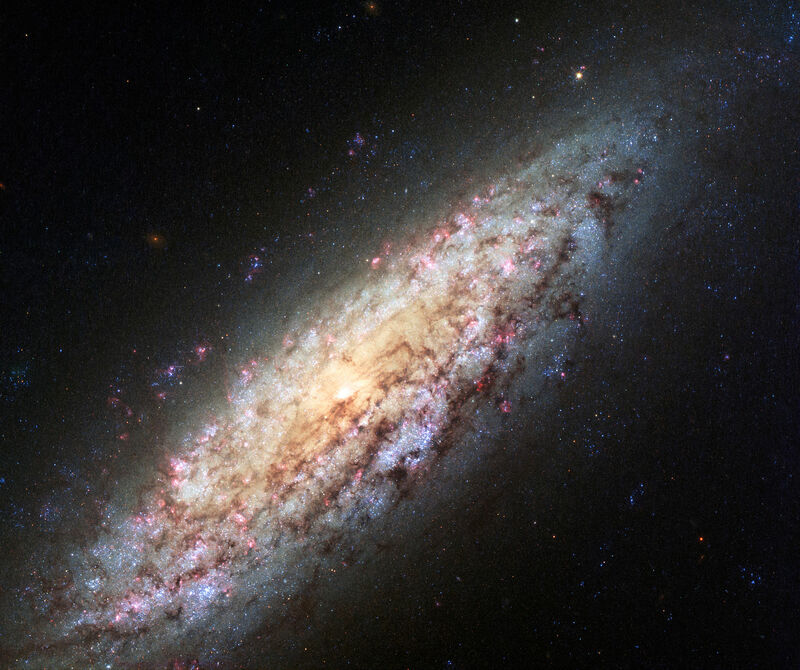 The paper uses Hubble Space Telescope (HST) images taken as part of the Legacy ExtraGalactic Ultraviolet Survey (LEGUS) to measure the extinction of stellar light caused by dust in 5 nearby galaxies (including NGC 6503, in the image above). Using a series of stellar models, they compared the brightnesses and colors of individual stars from the HST images to their theoretical brightnesses and colors using a parameter called Q. This Q parameter is independent of the dust in front of a star and only depends on the star’s initial mass and temperature. Once they had the individual stellar extinctions, they mapped out the dust in each galaxy by spatially binning the stars. These maps are useful for correcting other optical and IR images for dust, or for correlation to radio images of the neutral gas. Studies of the Milky Way have shown a constant ratio between the amounts of neutral gas and dust, and more recent work has found that this ratio in other galaxies is dependent on the galaxy’s metallicity. For their five galaxies, they found a relationship between the dust-to-gas ratio and galaxy metallicity consistent with previous work. This paper served as a pilot study for the rest of the LEGUS sample. Many of the galaxies in the LEGUS sample have multiwavelength data available, including radio maps of the neutral gas. Lauren and her co-authors plan to apply this method to more of the LEGUS sample in order to supply more extinction maps and further constrain our dust-to-gas ratio and metallicity relationship. You can find Lauren’s paper here. This entry was posted in Paper Spotlight, Science Highlight. Bookmark the permalink. Follow any comments here with the RSS feed for this post. Both comments and trackbacks are currently closed.